Guilt-Free French Fries - A recipe from Savor California, the online showcase for extraordinary gourmet foods and beverages from California. Peel the potatoes and cut into thin wedges. Divide the wedges into equal batches, if you want variety. 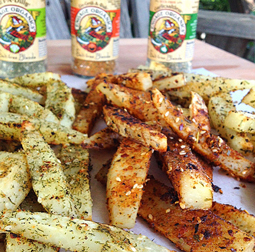 Coat the wedges in coconut oil and season each batch liberally with one of the Engage Organics seasonings. Place the coated potatoes on a foil-lined baking sheet and bake for 17+ minutes until browned. Note: Baking times will depend on the thickness of the wedges. A convection oven browns them nicely. A traditional oven will take a little longer. Finish off the potatoes in a frying pan without oil to get a charred effect. Sprinkle with more seasoning, as desired.